Peel & stick mirrors are the perfect way to effortlessly add a mirror to bedrooms, bathrooms, student rooms, or anywhere else you can think of! With many creative designs they will suit children and adults of all ages. 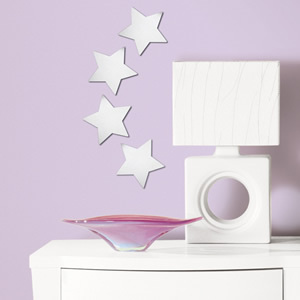 These mirrored wall decals are easy to apply, simply remove the liner and press firmly to the wall. Peel off the protective film and you'll find yourself with a genuine mirror surface anywhere you please! Cleaning is a breeze too, just wipe with a soft cloth and a little warm water to remove smudges or streaks. Please note: due to their weight, peel & stick mirrors use a heavier adhesive than RoomMates wall decals. For this reason we do not recommend repositioning mirrors after application. Only apply peel & stick mirrors to smooth, clean, and fully cured painted surfaces. Do not apply peel & stick mirrors to fresh paint or to delicate surfaces like fabric and wallpaper. If the mirror must be removed, slowly and carefully peel the mirror or adhesive from the surface using a hairdryer on low heat if necessary.